I sometimes tell teenagers I work with that middle and high school is one big crash course in relationship skills, with the operative word there being “crash”. There are often lots of crashes along the way. There is some major emotional “weight lifting” that takes place in high school. You know what happens in weight lifting. The muscles get torn down and then grow back stronger. Teenagers get torn down and, hopefully, grow back stronger…if the emotional weights are not damagingly heavy. My teen years were filled with highs and low, the best of times, the worst of times…depending on the day you asked me. While I had the best friends in the universe, I was also in class with some of the meanest girls ever. Well, I sure thought they were! On the tennis court I was confident. In school around peers I was painfully insecure. I was tall, thin, and awkward. I did not want to be told how much I would appreciate my height later. I wanted to be little and cute NOW. There were brilliant flashes of light in my teen years, moment of triumph, success and sweetness that I sometimes try to recapture in my mind and heart. There were times and spaces so small and dark that I was unsure there was room for me. Small, dark spaces like a cocoon. I wonder if a caterpillar feels like life is over, that he may not get out alive in one piece. In a way, he is right. Life as he knew it is over. And, he will not get out in the same piece he was before. I look back and see that I did a lot of emotional weight lifting as a teenager. It isn’t just a crash course in relational skills. It is also a training ground for what is going to take place in life…over and over and over and over again. Dark place. Life feels over. God brings us through. New LIFE. Joy. tolerate the pain, to endure the cocoon for what we have grown to know and trust is on the other side. I am friends with teens on Facebook. I spend time talking with teens every week for my work. I hear the “my life is over!”…over and over and over again. Sometimes it is for very, very good reason. Very, very hard things are happening and maybe the emotional weightlifting is overwhelming to the point of seeming permanent in its damage. Sometimes mom’s and dad’s want to rescue their teen from the weights. They try to lift the weights for them (helicopter parenting?). Usually, just as in weight lifting, we do need spotting, but on order to grow, we have to lift the weights with our own arms and legs. No lifting…no strength. One of the greatest ironies I have encountered so far is that while a girl (and boy) is going through the hormonal, “my life is over” changes of the teen years their mother is often going through the hormonal changes of peri-menopause. WHAT was God THINKING? With all the darkness of her own cocoon, a mother is less likely to try to lift her daughter weights for her. She has enough weight of her own to lift. I have a lot of women I greatly admire who have recently journeyed through peri-menopause to the final menopause. Let’s face it. I am almost closer to menopause than I am to menarche. I am right about in the middle depending on how the hormonal time clock ticks. I find myself wanting to believe that there is life after the child-bearing years…that there is life after being “mommy”. 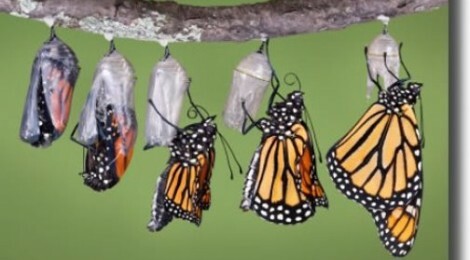 I want to know that I have another cocoon to burst from. I look at these women I admire, who have traveled so far, and they are astonishingly confident, calm. There is security and peace in their eyes. My mother likes her alone time, spends hours reading, tending to her flowers, organizing family get-togethers, and nurturing friendships. Maybe God knew it would be best to get both hormonal, “life is over” changes out of the way at once. Two simultaneous cocoons. Maybe He knew that while mom was discovering her new self that she would have less energy to lift the weights of adolescence that He had designed specifically for her daughter’s strength conditioning. LIFE waits for us after the darkness…over and over and over and over again. Through the bigger and smaller cocoons of darkness, I choose to trust that. I might need some reminding during the next phase of darkness. It will come. I can trust in that, too. Just don’t go snipping cocoons too early. Thank you for this post Emily! Emily, you are and always will be a great writer because you share about life issues! I’m so proud of you and appreciate the opportunity to be encouraged and to be one of your readers! Great insight! God surely knows what He’s doing!